Sources close to the situation have informed us that an abortion was the cause of the break-up between undefeated pound-for-pound king Floyd "Money" Mayweather and his former fiance, Shantel Christine Jackson Mayweather. According to documents obtained by FightHype.com, Ms. Jackson had an abortion not long after learning she was pregnant with twins by Mayweather. According to one source, Jackson originally claimed to have had a miscarriage, but it didn't take long for Mayweather to discover the truth of the abortion. 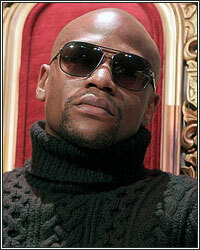 Mayweather was said to be affected "emotionally and mentally" as abortions go against his belief of killing babies. Furthermore, we're informed that Mayweather began to question if the babies she was carrying were really his, causing him to call an abrubt end to the relationship. Mayweather first hinted about the loss of the babies on the third installment of All Access: Mayweather vs. Maidana. It's unclear at this point if the situation had any impact on his training as he gets set to unify his WBC welterweight title against WBA welterweight champion Marcos Maidana this Saturday.